Although its common to hear unbelievable news from our beloved country Pakistan time to time but yesterday i heard a news that really shocked me. A New born baby boy was bitten badly from a rat in Holy Family Hospital of Rawalpindi this Tuesday. 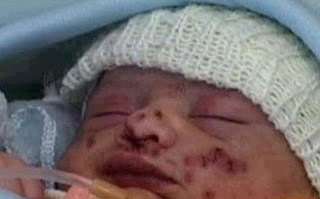 The baby was present in the gynaecology ward where he was bitten by rat in the night. the baby is having marks on several places on the body. the baby was born to Rahila Bibi who specially came to Rawalpindi for delivery of her baby from Taxila. After this shocking incident the Hospital Administration has announced to start inquiry of the incident and promised to take necessary action. The Situation of Government hospitals is really poor in Pakistan. Poor people and middle class is forced to go in Government hospitals because they can't afford expensive private hospitals.